You're the kind of girl who lives her life by the moon. The monthly full moon calls for a traditional ritual, with a smudge stick, burning candle and a long list of everything you'd like to get rid of. Writing down all the negative thoughts swirling in your head then setting it aflame is a great way to eliminate them from your life. Of course, you participate in new moon rituals too, involving grounding your soul, setting new intentions for the future and transcending your life. If you participate in moon rituals and find yourself looking for the shining sphere of light in the night's dark sky, then you're most likely a Sailor Moon fan and a fan of the crisis moon compact bag. Featuring the traditional Sailor Moon symbol, this trendy bag is soon to become your BFF. Measuring approximately 9-inches wide, the officially licensed Sailor Moon bag features soft-sculpted, embroidered and appliqued graphics. With an adjustable shoulder strap, this zip-up purse is capable of holding small and valuable personal items while you're on the go. 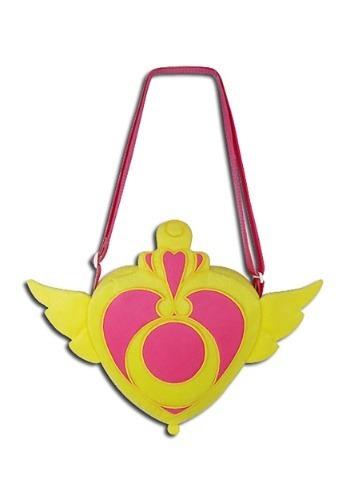 If you love this handbag, then check out our Made by Us line of officially licensed Sailor Moon costumes.